« Was a 14th c. queen the first to survive a caesarean? An excavation in Yehud, Israel, prior to construction of new housing has unearthed a unique ancient pottery jug topped with a figurine in a reflective posture reminiscent of Rodin’s “The Thinker.” The clay vessel was discovered on the last day of the dig by a team of professional archaeologists from the Israel Antiquities Authority and very fortunate high school students in an archaeology-themed matriculation stream. It was one of several artifacts and remains — daggers, arrowheads, an axe head, sheep bones and the bones of another animal, probably a donkey — found with the jug. Archaeologists believe at least some of these were funerary offerings for a prominent individual, and an extraordinarily rich array of grave goods at that. The pot-bellied jug with a spigot on one side of the neck is of a shape and style common to the Middle Bronze Age period about 3,800 years ago, but the figurine attached to the neck is one of a kind. Nothing like it has been found before. The figurine appears to have been added after the basic vessel was complete. 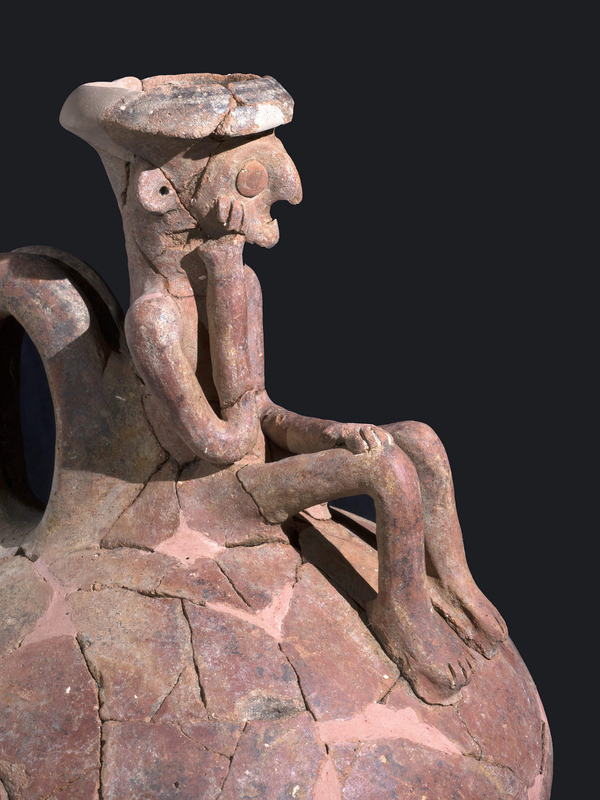 Archaeologists aren’t sure if the same potter who made the jug also created the figurine. It’s possible a second artisan created it, using the neck of the jug as the torso of the figure and then adding the arms, leg and face. 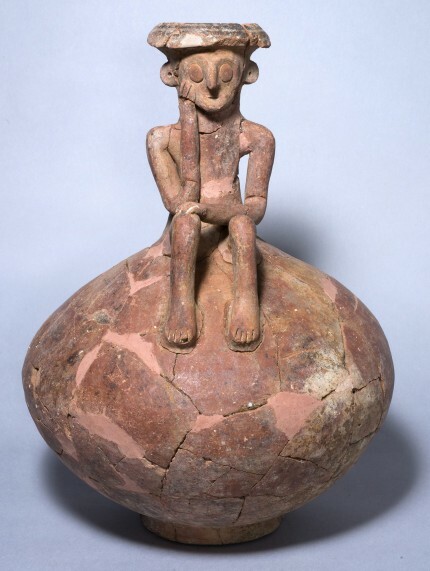 The figure sits on top of the jug, his knees bent and left arm crossing both knees. His right arm is bent, elbow behind the other arm on his knee, his hand holding his chin as if he is deep in thought. The degree of detail is exceptional and very unusual for pottery of the period. 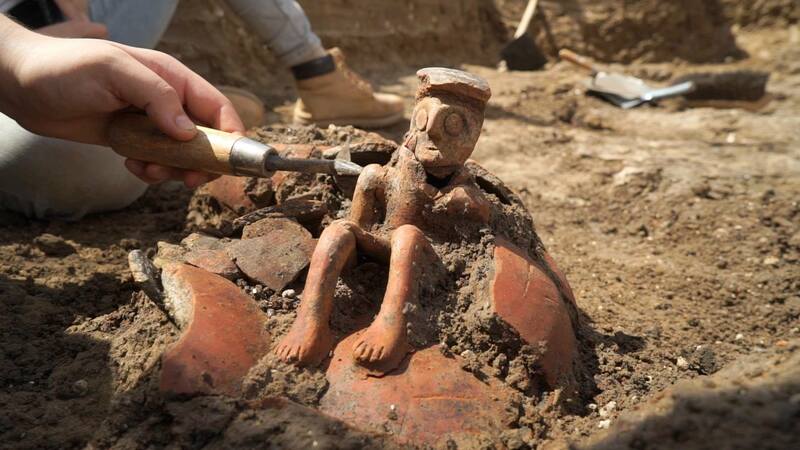 The students who got to see this charming figure excavated are thrilled. 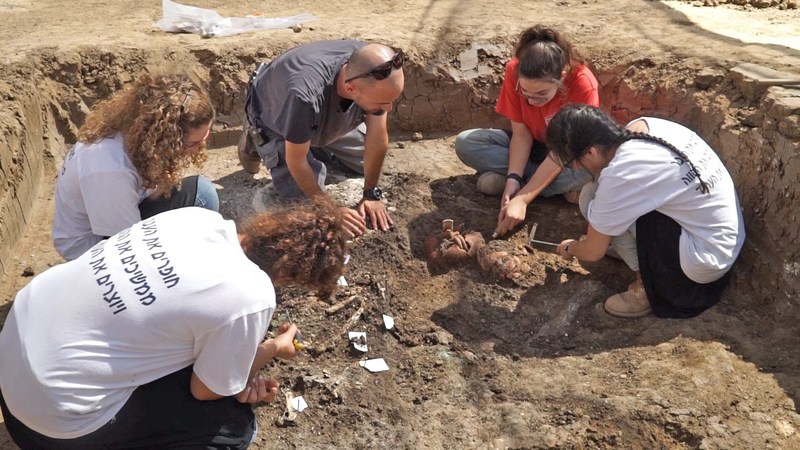 “Suddenly I saw many archaeologists and important people arriving who were examining and admiring something that was uncovered in the ground” recalls Ronnie Krisher, a pupil in the Land of Israel and Archaeology stream in the Roeh religious girls high school in Ramat Gan. “They immediately called all of us to look at the amazing statuette and explained to us that this is an extremely rare discovery and one that is not encountered every day. It is exciting to be part of an excavation whose artifacts will be displayed in the museum”. This entry was posted on Saturday, November 26th, 2016 at 12:51 PM	and is filed under Ancient. You can follow any responses to this entry through the RSS 2.0 feed. You can skip to the end and leave a response. Pinging is currently not allowed. And unlike Rodin, the craftsman put the elbow on the correct knee. That’s what I call a THINK-TANK ! The more they drank, the more the heavily sought-after (or thought over) solution(s) became visible. Alternatively, so to speak as a back-up solution, they had bronze swords and clubs for the use in Bronze Age expert panels. I know what it reminds me of. Kilroy was ‘ere. And that tiny underbite! His earlobes are pierced so he may have had ear rings once. He reminds of a poem I learned as a boy regarding constipation. I’ll keep it to the the first line. “Here I sit all brokenhearted”. No wonder he looks perplexed. This is so exciting. Yehud is a small town right across the road from my kibbutz. Interesting place for such important finds because even though it is not far from the “Kings Highway” going from Damascus to Egypt there are no natural water sources close by for such an early settlement. The fact that a complete archeaological survey was done there means that there was evidence of something to come. I am jealous of the high school students that were invited to help! That’s pretty much how I look like at a bar after six or so pints. Susie, since you are on the spot, what is the current state of the truly demented project to level the old center of Yehud and build a replica (of sorts) of Lugano, Switzerland? I can’t find anything terribly recent on-line, but there is probably a lot that I am missing in Hebrew. I did find a few site reports from the current rescue archaeology initiative. This is astonishing discovery and amazing statue. I don’t want to veer off subject here but i just want to say that this discovery is another proof that the canaanite arabs actually lived in Palestine way before “”other”” people. ..
” and “other”, have claimed canaanite origin without scientific evidence. Ninda might remind you of (panis=bread), e-iz-za-at-te-ni of (ihr esset=you are eating) and wa-a-tar of (water), whereas in Arab (or is it “other”? ), the expression for bread is seemingly something odd like ‘khubs’. All this not to veer off topic, of course, as my initial hypothesis did so far NOT imply water, and in contrast to “other” religions that put a highly questionable ban on beer, they are proud over here to have a religion that has been producing the stuff for itself ever since (Egypt too). Never heard of plans to renovate the old center in such a way. Do you know the area? The old center is now surrounded by ten story apt buildings. Dont know what Lugano looks like!! And just saying….. Why cant we just enjoy and let be what is not the subject of this very interesting blog.